Historic building,*ELEVATOR,1 double bedroom,1bathroom,1large sofa bed . WELCOME in our family apartment .Minimum stay from 4 nights. .ELEVATOR.. The apartment - a gem in Florence - is located in a pedestrian street (car access is restricted to taxis only). It is few steps from UFFIZI GALLERY main entrance and SIGNORIA SQUARE ,across STREET ,LITERALLY ! The apartment is situated in one of Florence’s most exclusive neighborhoods also. The building is fully renovated ; few apartments and it has an ELEVATOR ,a rare feature in the buildings of the ancient historic center of Florence, so it is not necessary a lot work with sitcases or shoppings to reach the flat also . It is a great comfort in the private flats in the authentic historic medieval centre of Florence , often the buildings are restored by ancient medieval towers. The apartment is graciously furnished and tastefully decorated in typical tuscan style, with wooden beam ceiling and cotto flooring. 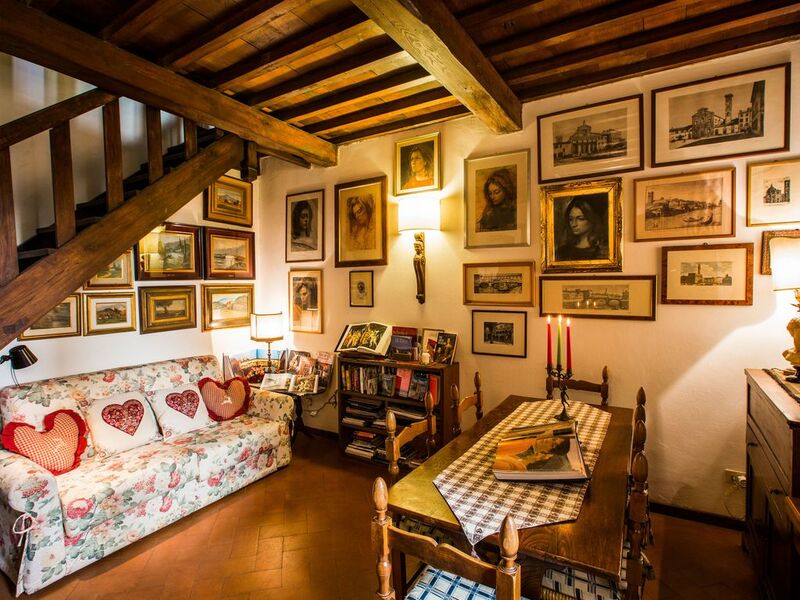 It has been completely renovated preserving its original historical florentine character. It is 60 sqm arranged over two floors and comprises : on lower level, hall with small storage room, separate kitchen with a small table for breakfast, living room with sofa-bed ( three quarter high quality bed) and dining table with seating for up to 6 people. Inner stairs lead to the upper level where is a cozy large bedroom with double bed (divisible into two single beds if required), a built-in closet, a modern spacious bathroom with bath-tub and wall-mounted shower. All rooms have windows overlooking the quiet inner courtyard of the building (with no cars parked).It is peaceful in the night and quiet in the morning . **All windows have screens to keep mosquitos out to ensure maximum comfort during warm period (a rare luxury in the city apartments and a considerable comfort during summer). The apartment is furnished with tuscan furniture and it offers a romantic feeling thanks to old paintings and vintage reproductions. A florentine atmosphere, original and unique . For the excellent location and for the original interiors it is a dream for art lovers . The building is in the same street of ancient and famous Italian Georgofili ‘s Accademy the first public association in Europe specialized in agricultural studies and conservation of the territory since 1753. ( the back of its main entrance –the main entrance of Accademy is in the Uffizi ‘s Gallery ) . You will also note the older Torre dei Pulci (a tower deriving its name from a noble family which owned the building), still visible from the street. Nearby you will find the most beautiful coffee bars and shops of Florence ; elegant wine bars and characteristic "panino toscano" shops based on florentine culinary specialities ; markets supplied with everything ( high quality ) ,rotisserie ,bakery -all of them- open in the Sunday also. It's also easy to come from florentine Vespucci Airport to Santa Maria Novella main station , there is shuttle bus every hour connecting the airport with the central station or taxi (fixed rate –time approximately 20 minutes). To come from main station to apartment is an walking distance ( 15'/20’ through the spectacular beauty of Florence and fabulous shopping also ) or taxi from station .The location is UFFIZI GALLERY . .This is a non-smoking apartment --- Sorry no pets allowed ---- Air conditioning in the bedroom . A fan is available also . Can provide convenient cleaning service upon request. Check-in is from 3 pm to 6 pm. Check-out within 10,30 am. *For early check-in/ or late check out time please ask.Thanks. About arrival later than 8PM please contact us .We 'll do our best for you. Thank you . Utilities: Up to €5 Euros/day included in the rental price. Additional usage paid in cash on departure based on meter readings taken at arrival. **Final cleaning €50 in cash upon arrival up 1 week .For longer stay more than 1 week € 60. For montly stay € 80. **The price on website is for two guests only. The use of the sofabed involves always an daily expense of € 30/night and the final cleaning € 35 . Thank you. Florence It is my native city, the place of my childhood and university studies.I graduated in Florence and I am a professor of Liberal Studies in public school. I love the art and my city . The apartment was passed down through the family . The flat is really a few steps from Uffizi’s main entrance (literally less than 1 minute walk, across the street!). It is located in a pedestrian street, in a protected area of Florence: a short medieval street behind the Uffizi Gallery and an ancient Accademy. No pubs or night clubs in the way. The street is very quiet ,clean (truly a safe place for women traveling alone),it is guarded being so adjacent gli Uffizi. The apartment is on the second floor (third one in american designation) of a small ancient building, fully renovated, with few apartments. There is an ELEVATOR very useful for people ,so there's no need to carry your suitcases (or shopping bags) up the stairs. You can visit Florence, night and day, walking everywhere. In the neighbourhood you can find everything you need for a good stay. YOU WILL BE IN THE HEART of FLORENCE and will stay in a private Florentine home . The bathroom has a bath-tub with a wall-mounted shower, a washbasin, a bidet, WC and washing machine (no dryer)with instructions in English provided.Toilet paper, bath foam, soap, laundry soap, 1 hair-dryers and towels provided. In the bedroom .Also fan is available for every need. The washer machine is in the bathroom with instructions in English provided. WIFI , no shared with others apartments. A great comfort in the florentine historic buildings,often the buildings are from the ancient medieval towers. Italian MOKA for 3/4 espresso cups. Beautiful art books on Florence and Uffizi Gallery and some english guides are available to visit Florence and environs. Wonderful place just perfect for two people. Great location just steps from everything you want to see and do. Rosella was an excellent host. She lives in Pizza but greeted us and went over every thing when we arrived and also took the time to meet us when we left. The apartment is full of various books, many in english, of all the things to do and see in Florence as well as the city's history. The walls are covered with beautiful paintings of a world renowned artist from the area and she has a book about his life story. I would highly recommend this property. Dear Guest thank you for taking the time to write the review of my apartment and on me. away. It was a real pleasure to make your acquaintance, Florence still deserves your visit. I'll wait for you again! Thank you so much ! Rossella the owner . The apartment was beautiful, well furnished and decorated, and comfortable. Rossella was incredibly kind and accommodating. I would most certainly stay here again. The neighborhood was fabulous, right in the center of everything, but still calm and quiet at night. Dear Guest thank you for taking the time to write the review of my apartment and on me. I'm glad you enjoyed the typical Florentine furnishings coming from my family, such as the rich collection of paintings and art books on Florence in English . An original and unique atmosphere that goes with the comfort offered by the apartment ; a location few steps from the Uffizi Gallery main entrance and Signoria square .I hope to meet you again in the future ! All the best.Thanks again.Rossella the owner . This apartment is perfect for travelers who want to be right in the heart of Florence. The location could not be better and the apartment is full of guide and art books as well as artwork. There is a nice TV and DVDs for down time and great wi-fi as well as an elevator and a washing machine. Absolutely a wonderful apartment and host. This apartment is centrally located on a quiet side street with easy access to the Ponte Vecchio, the Uffizi and all the areas most famous sites. A lovely and spotless 2-level unit with living, dining and kitchen areas on the main floor and a beautiful sleeping area and bathroom w/tub on the second floor. The kitchen was well equipped and local markets were so good we dined several nights in the unit. Your host is dedicated to ensuring that you enjoy your time in Florence. We made good use of the in house library of guide books during our stay. I would not hesitate to recommend this apartment. I cannot tell you how much I adore Rossella and her most excellent apartment! Rossella is the most kind & generous, sweet & friendly person you will ever meet; she is the best landlady for a vacation rental I have ever met. She went out of her way during the planning phase of my trip to help me with questions/answers and to find information. She greeted me upon arrival and showed me where all the shops were that I would need. The apartment itself is charming, quiet, cozy, well-appointed, and beautifully decorated. It has every single thing a vacationer could possibly want; Rossella outfits the apartment as if she were staying there. As a single woman travelling alone, I am always very concerned about location, safety & security. All of the criteria were met. It was a 5-minute walk to Duomo and Baptistry, one block to the Arno, two blocks to Ponte Vecchio. Next door is a church where they have evening concerts on occasion; I got to see one while I was there. The Accademia was a 10-15 minute walk and the train station is only 15-20 minutes at the outside. I didn't know that when I arrived so I got a taxi to the apartment, but people walk all over Florence with rolling luggage, and after I had walked to Church of Santa Maria Novella next to the station and realized how close it was, I was perfectly comfortable walking to the station with my suitcase on the morning I departed by train for Rome. Everything else was even closer to the apartment - Uffizi, Bargello, Palazzo Vecchio, and on and on! I always felt perfectly safe to venture out at night - once to the Arno to watch the sun set over the Ponte Vecchio, often around the corner to Carapina for gelato (they got to know me, I went so often!) - that's the best gelato in the city, by the way, and one evening to the church concert and another evening around the corner to Piazza de la Signoria just to sit and watch people. There is a good police presence in the area, particularly at the Signoria, and at Uffizi. Oh, and be sure to ask Rossella about the significance of the olive tree and the statue mounted high up on the exterior wall of the Uffizi, visible from the street outside the apartment. This was a beautiful city, easy to navigate, and the apartment is so perfectly located, you can't beat it! And, personally, I liked having a bedroom and bath upstairs - it gave me the feeling that I had actually gone somewhere, like walking around at home! Oh, and comfy bed and lots of towels! Dear Guest thank you for taking the time to write such an extensive and detailed review of my apartment and on me. I really appreciated your words. I try to do my best to offer all possible support to my guests, especially for those traveling alone and I'm happy when my commitment is recognized.Thank you again for your beautiful valutations. Florence excites for its extraordinary beauty so I hope to see you back in this wonderful my native city so that to meet you once again !All the best .Rossella the owner. For our stay in Florence, we looked for an inexpensive apartment, in a downtown location that had lots of good reviews over a long period of time. Rosella’s place had all of these. She has been a member since 2008 and every one of her clients (but one odd one) has given her apartment a spectacular rating. We too give her a spectacular rating. The apartment was just what we wanted. My wife and I like to get up late in the morning. We prepare breakfast before going out sightseeing. Typically we are gone all the day and we eat dinner out. We come home late and have snacks with wine or grappa before heading to bed. Rosella’s apartment was a great home base. It is quiet; we were never woken by noise even though we always had the bedroom window open overnight. The apartment was warm and very clean. The bed was big and comfortable. We always had hot water. The apartment had everything we needed. There were lots of extra towels blankets, sheets and pillows. There were at least 3 dozen travel guides and books on Florence art. There were all the cleaning supplies you would ever need. The kitchen is small but worked very well for us. There is a 2 burner stove that was adequate for our breakfasts and a small microwave. The fridge is a small “dorm” type fridge but held everything we needed. There is no oven, so you can’t bake or roast but we didn’t need to. The bedroom and bathroom are upstairs and the kitchen and dining room downstairs which is nice if one of us got up earlier or stayed up later to finish off the wine. And of course the apartment was close to everything. It’s around the corner from the Ufizzi, 2 minutes from the Ponte Vecchio, 2 min from the Piazza della Signoria. All of the sights, museums and churches of Florence are within easy walking from the apartment. There is a grocery store only 5 min away. We had a terrible flight to Florence. Our initial flight was delayed so we missed our connecting flights. We kept in touch with Rosella as our final arrival times kept changing. She juggled her schedule and still met us at the apartment when we arrived almost 12 hours late. Thank you very much Rosella. We were very happy with the apartment. It met our needs wonderfully. If you are coming to Florence to spend all of your time in an apartment, then maybe this place isn’t for you. But if you want a nice home base from which to explore the city, this place is ideal. Come and enjoy an unforgettable holiday in the very heart of historical Florence! Homely and comfortable, the apartment is just behind the Uffizi Gallery, one of the world's oldest museums, with a priceless collection of Renaissance art and other masterpieces, including Sandro Botticelli's Birth of Venus and Leonardo da Vinci's Annunciation. A short stroll away are the beautiful Piazza della Signoria, Ponte Vecchio (Old Bridge) and the Duomo with the Bell tower by Giotto. This is a prime location for sightseeing and entertaining. The area is safe and has plenty of shops, restaurants, cafes and theatres. The apartment is exceptionally convenient and such a time saver for anyone looking to see most of Florence's sights in a short while. A lovely olive tree in front of the building will be your point of reference, always showing you the way back home. Other Activities: Promenade along Arno river (few steps from main door of the building)and to admire the view. Utilities: Up to €5 Euros/day included in the rental price. Additional usage paid in cash on departure based on meter readings taken at arrival. Final cleaning €50 in cash upon arrival up 1 week .For longer stay more than 1 week € 60. For montly stay € 80. For long stay utilities are not included. An advance is required on approximate consumptions based on period,refunded based on really consumption.Thanks . **The price on website is for two guests only. The use of the sofabed involves an daily expense of € 30 and the final cleaning € 35 . Thank you. @@@Check-in is from 3 PM to 6 PM. Check-out within 11 am. @@@ For arrival later than 6 PM please ask.-----For early check-in/ out time please ask.Thanks.